Nothing’s more important for revolutionary change than ethical consensus building, yet your brain’s basal ganglia works against collaboration. Worse, it locks you into comfort zones. How so? Faced with innovation, your amygdala poses threats against ongoing change and tempts leaders to settle for safe routines. It takes gifted facilitators to create the kind of consensus that value the good of the people. In government, lack of consensus leads to personal power struggles, and prevents insights for change. In education, lack of consensus means stagnation that lead to crisis more than learning. An economy, without consensus creates fear and panic. 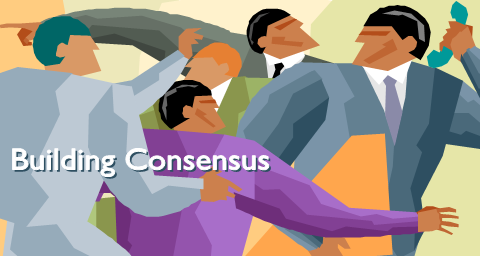 Consensus building takes brain-power tools to disagree with respect, and to construct improved realities across one another’s differences. Check out mind-bending insights for collaboration at the Financial Post. What builds innovative consensus through prospering diversity where you work? Competition- Barb or Boost to Brainpower? Thanks Mary Jo. While nudging my own noodle through the boosts and barbs of competition -I received an invitation to keynote for similar topic at a large university. The brain teaches us daily – and that’s what keeps me alive in great exchanges like yours! Wish we could do a project together on Leadership – with the brain in mind:-). Can’t wait to read the post on competition, Ellen. Thanks for your kind encouragement! Mary Jo – what a great question, and one that should have been addressed long ago at Brain Leaders and Learners! Competition – Barb or Boost to Brainpower? Love the way you run with and apply and reflect on results from new ideas, Mary Jo. Thanks – you inspire us all. Where does competition fit into all of this? Is there a brain based role in competitiveness? I’ve often said that it is hard for leaders to collaborate when they’ve been enmeshed in a world of sports and war analogies that drive competitive behavior: “Kill the competition”,”First to the finish line”, etc. Thanks for the thought -provoking post!